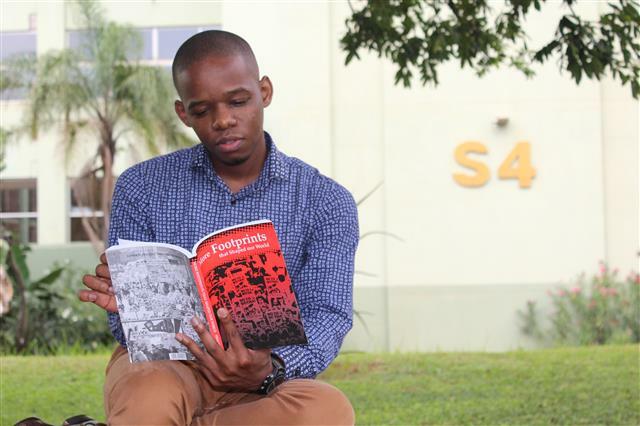 A young scholar from DUT has been named as one of the ten 2015 Harry Frank GuggenheimYoung African Scholars Award winners for his academic project which will investigate the impact of township spaces on young black people in South Africa. The prestigious Young African Scholars Award is part of the Harry Frank Guggenheim Foundation, an American private foundation, supporting research on challenges related to violence and aggression. Ndumiso Daluxolo Ngidi, 28, a Student Development Practitioner within DUT’s Department of Student Governance and Development, will jet off to Nairobi, Kenya in March, where he will discuss his work and that of other scholars during a meeting scheduled to take place from Saturday, 21 March 2015 to Wednesday, 25 March 2015. Ngidi will be awarded $2000 (approximately R22998.00) to compile a research proposal and he will be offered assistance until its completion. Ngidi, who holds a Master’s degree in Developmental Studies, also mentors young people from township areas and he is highly active in community work. He completed his Master’s degree in 2012 and recently submitted a paper based on his research which was titled: Attitudes towards abortion in post-apartheid South Africa. In June 2014, he became a MAC AIDS Fellow after completing a series of intensive workshops and running a project called Inyathelo Lethu. The MAC AIDS Fellowship brings together people across different parts of South Africa to help them run projects around HIV and gender-basedviolence prevention. In July 2014, Ngidi was nominated as the Curator for the Global Shapers Community- Durban Hub. The Global Shapers Community is a global initiative by the World Economic Forum in Geneva, Switzerland. It brings together a network of young extraordinary individuals with great potential for future leadership roles in society, verifiable achievements and are highly committed to developing their leadership potential towards serving society. “Last year, I started the ‘Inyathelo Lethu’ project designed and developed as an intervention for addressing HIV and gender based violence among learners in Secondary Schools”. The project brought together two groups of peer educators, one being a newly established group at Senzokwethu Secondary School in Ntuzuma township and another group from DUT. The two groups collaborated in developing and implementing a HIV and gender based violence prevention curriculum in the secondary school. The project reached 200 pupils through workshops and weekly dialogues. In addition to a reported increase in confidence, self esteem and leadership at school, many of the learner participants had a marked increase in their school grades. Due to their interaction with the DUT students, the pupils also showed increased interest in future opportunities such as higher education,” he said. He said he was still in disbelief about being selected for the 2015 Harry Frank Guggenheim Young African Scholars Award, saying being considered as one of the ten Young African scholars is no small feat, especially by this particular foundation. Sadly however, Ngidi’s story does not have a happy beginning. After the death of his mother when he was a year old and his father when he was eight, he “buried” himself in his schoolwork which led to other people mentoring him after noticing his hard work and dedication despite the adversity he was facing as a result of being orphaned at a young age. “I completed my first degree overseas at the Michigan State University after I was selected in the Study Abroad Programme through the help of my first academic mentor, Dr Anthony Collins, who lectures Journalism at DUT. He shaped and molded me into the man I am today,” said Ngidi, adding that the personal struggle he endured as a result of being orphaned also drove him to constantly strive for success. “After my parents died, I happened to be at the mercy of other people including relatives and neighbours. I wanted to be independent, and at a very young age, learned to be a man. It was and is still hard and painful but it shaped me in a way. I guess life has a way of bringing out the best in you through adversity,” said Ngidi. Partnering with more township schools to reach a larger population of pupils as part of his Inyathelo Lethu project is part of Ngidi’s plans for the future.